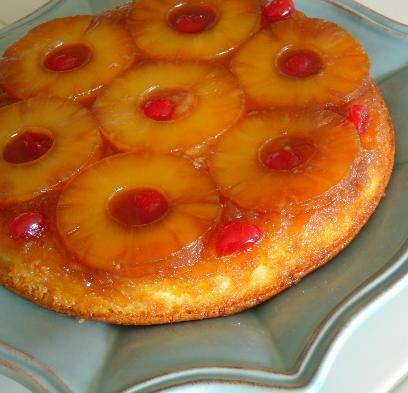 If you are looking for an easy to prepare cake that looks and taste great, you should try this classic Pineapple Upside-Down Cake recipe. It makes an eye-catching centerpiece on the table without even bothering to whip up some icing or frosting! Here is an easy Pineapple Upside-Down Cake recipe that will surely bring back many childhood memories. Add enough water to reserved pineapple juice to measure 1 1/4 cups. Make cake batter as directed on box, substituting pineapple juice mixture for the water. Pour batter over pineapple and cherries. Bake 40 to 45 minutes (42 to 48 minutes for dark or nonstick pan) or until toothpick inserted in center comes out clean. Immediately run knife around side of pan to loosen cake. Place heatproof serving plate upside down onto pan; turn plate and pan over. Leave pan over cake 5 minutes so brown sugar topping can drizzle over cake; remove pan. Cool 30 minutes. Serve warm or cool. Store covered in refrigerator.